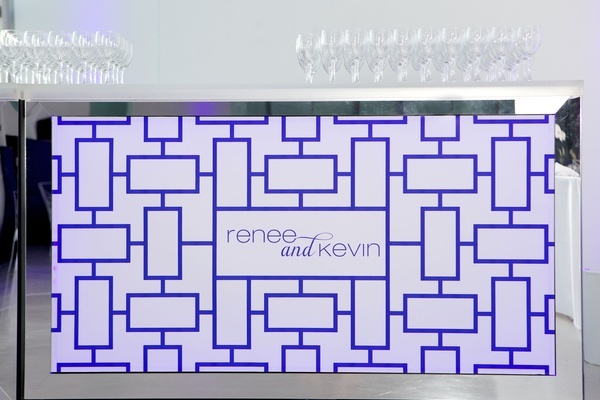 On their five-year dating anniversary, Kevin surprised Renee with an overnight getaway in downtown Chicago to celebrate. Following dinner, the groom took his beloved on a summer stroll behind the city’s historic water tower before getting down on one knee. “I had known for a couple years that I wanted to marry her,” beams Kevin. 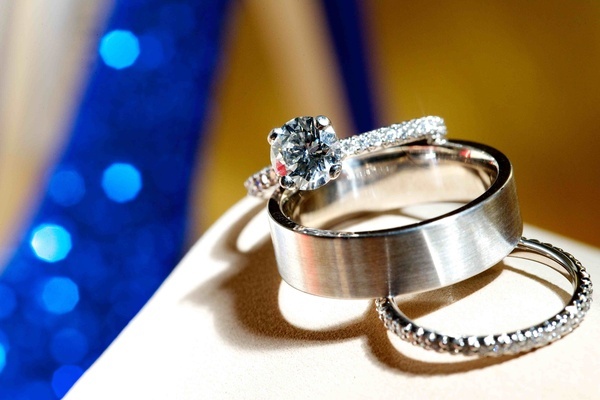 “I just needed to find the perfect ring.” Once her initial shock had resolved, Renee said, “yes!” to her longtime love, and the planning commenced. 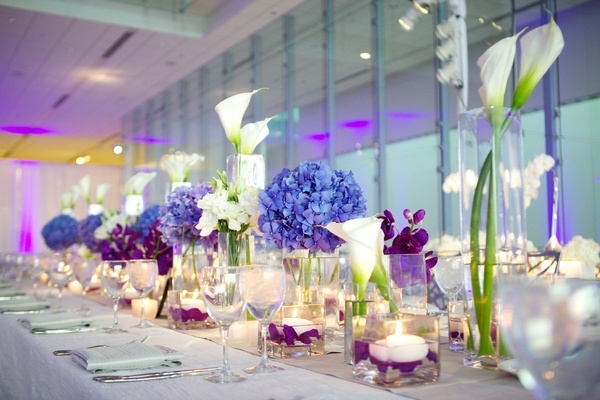 Originally considering a destination wedding, the couple ultimately decided to host their celebration at a state-of-the-art venue in Chicago, close in proximity to the site of their engagement. “We were both raised in the southwest suburbs of the city, so it was an easy decision,” explains Renee. 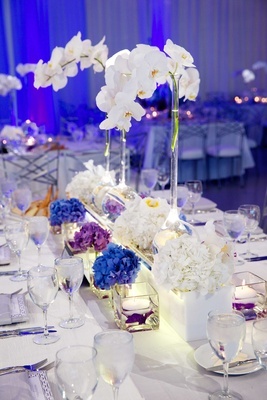 “It was important to us that our family and friends were able to be with us for our wedding weekend.” A clean, crisp, and modern wedding theme – featuring a classic color palette of white, black, and grey with accents of violet and blue – was selected to highlight the venue’s contemporary design, while romantic candlelight was used to accent the sophisticated décor. 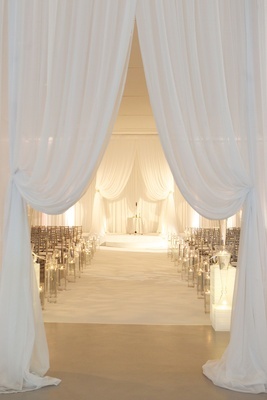 The ceremony space was a vision of white with metallic and crystal elements. 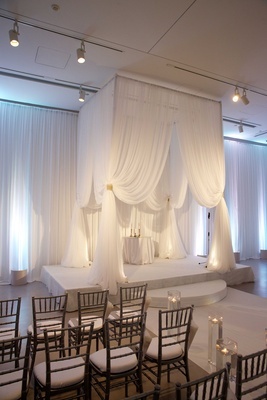 Elegant drapery created a dramatic entrance and softened the space, and floating candles in tall, square vases of varying heights lined the romantic aisleway. Renee was resplendent in a strapless white gown in silk radzimir with exaggerated bow detail in back; her “something blue” was a striking pair of glittered peep-toe pumps. 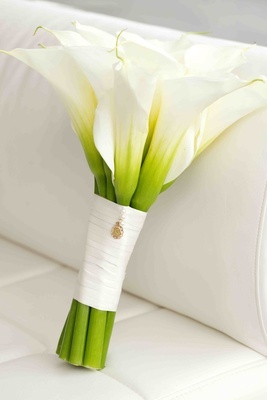 To honor past generations, the bride carried a bouquet of calla lilies pinned with a lovely gold pendant belonging to her late paternal grandmother. 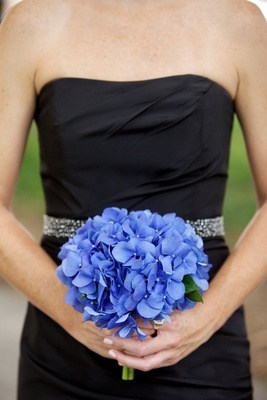 Eight bridesmaids wore floor-length, strapless ebony gowns and carried bouquets comprised of blue hydrangeas, while seven groomsmen stunned in black tuxedos with grey ties and matching boutonnieres featuring miniature calla lilies. 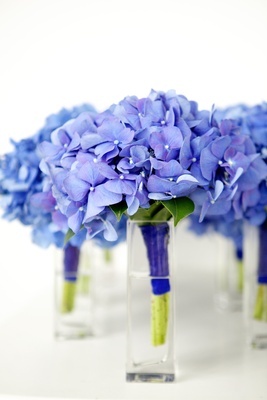 Though the décor was exquisite, the ceremony was not without a few unexpected mishaps. “I messed up my vows in the middle of the ceremony,” admits the groom, who was able to laugh it off with the crowd. Shortly after, his bride nearly missed the most memorable part of their nuptials: “I was so excited after we were pronounced husband and wife that I almost forgot our first kiss as a married couple!” exclaims Renee, who couldn’t wait to join together with loved ones for the celebration. 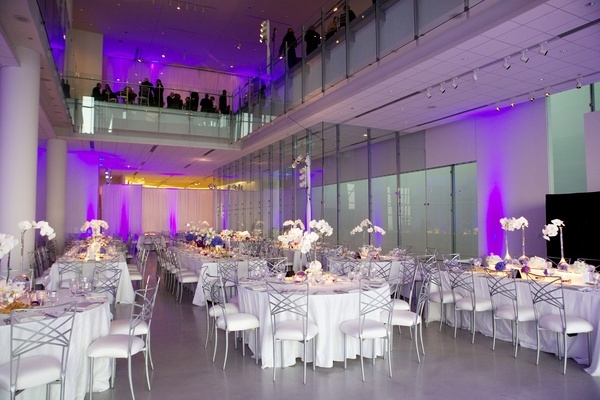 The reception room featured breathtaking views of the city and was accented with blue-violet up lighting to highlight the modern and clean interior design of the space. 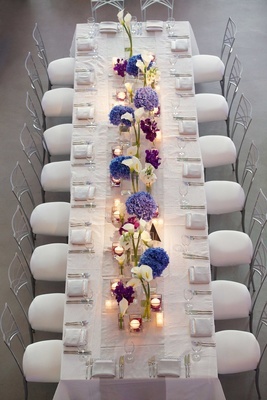 Dinner tables in varying shapes were swathed in vanilla linens, and rectangular tables displayed additional silver runners. 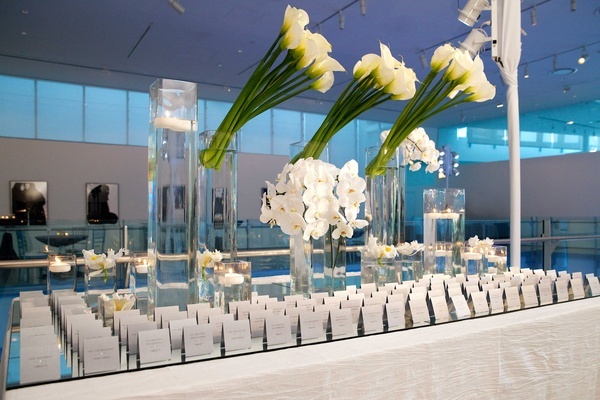 Centerpieces differed by table type and featured various arrangements of white calla lilies, hydrangeas in blue and alabaster hues, and orchids in shades of purple and pearl emerging from a collection of translucent vessels in varying sizes. Dessert and dancing followed a delectable sit-down dinner service. 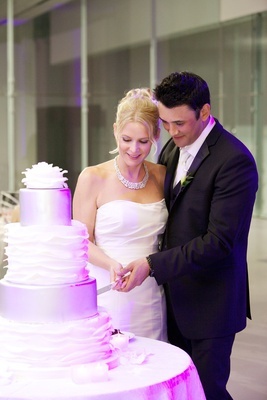 “The food was really good,” boasts the groom, though the couple’s glamorous cake was most memorable to guests. Decorated with alternating layers of sleek metallic and white ruffle tiers, the confectionary incorporated tantalizing flavors: pumpkin cake with salted-caramel buttercream frosting, chocolate-bourbon cake with peanut butter buttercream, and almond cake with strawberry buttercream. A diverse selection of homemade gelato was also served throughout the night. As libations began to flow from the custom-built bar, wedding attendees joined the newly married couple on the dance floor. 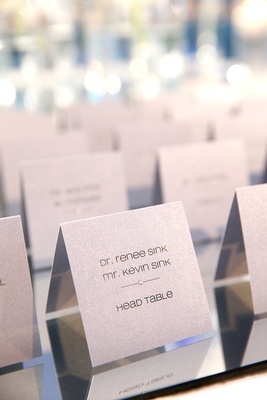 Guests discovered “dancing shoes” (flip-flops) on display near the DJ booth, and rested their feet on plush lounge furniture. Late-night snacks including soft pretzels, miniature Chicago-style hot dogs, and sliders were served throughout the entire evening to keep loved ones energized. “It was a dance party all night long,” confirms Kevin. 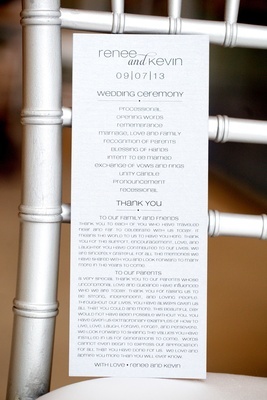 Renee admits that she knew planning a wedding would be fun, exciting, and stressful along the way. 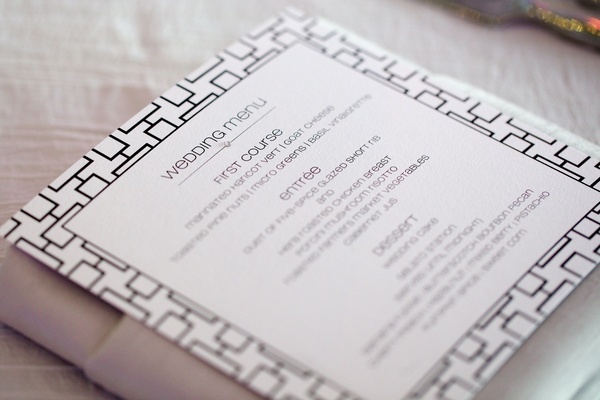 "Initially, we were focused on finding a great photographer and venue, as well as a good selection of food and drinks," she explains. "In the end, every detail became important!" Though the couple faced unexpected and emotional obstacles along the way, fate had finally united the couple as husband and wife. 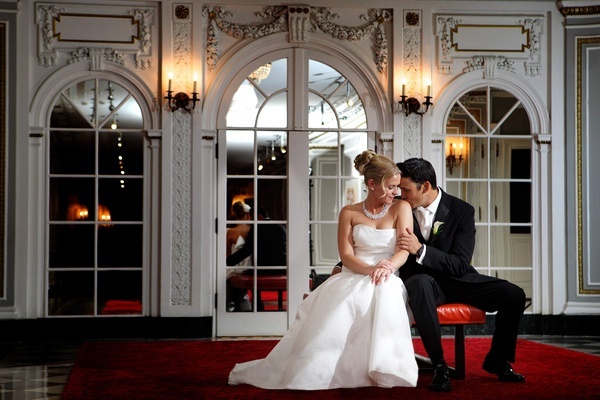 Both bride and groom agree: "It was a perfect day!"